I did have quite a bit of down time this weekend, but I also worked on my kitchen cabinets…of course. I got quite a bit done on the upper section of the wall of cabinets, but I’m just about at the end of my rope with paint problems. When I left you on Friday, my cabinets looked like this. The left section had two coats of paint, and the middle and right sections had one very streaky coat of paint. Now here’s the deal. I had one heck of a time deciding what paint I wanted to use on my kitchen cabinets. Y’all know that when it comes to kitchen cabinets, I’m partial to oil-based paint. It goes on so smoothly, looks gorgeous, and dries super hard. So I went home and got busy painting my cabinets with the flat paint from Kelly Moore mixed in the color Derbyshire (from Sherwin Williams). I had never used their latex paint before, and I was initially very impressed with the paint. It went on very smoothly — as smoothly as Behr does when I add Floetrol paint conditioner to it. But it’s thinner than Behr, and I noticed that even the parts that had two coats on them still showed streaks of white primer in places. So it would have taken a minimum of three coats. I’ve never had to put three coats of Behr paint on anything. Even when I painted white paint over the black walls in the second bedroom of the condo, I used regular Behr paint, didn’t bother to use primer, and it covered completely in two coats. It was a pretty quick job and I left it at that for Friday, and then relaxed and enjoyed the rest of the day off. Then on Saturday I headed into the kitchen and just wanted to check the durability of the paint. I ran my fingernail over the surface of the paint pretty lightly without even putting pressure on it, and the paint scratched off down to the primer!!! I was so frustrated. Paint should not come off when scratched that lightly, and there I had painted my entire section of cabinets with that paint. So I headed to Home Depot and grabbed a gallon of Behr flat paint mixed in the color Derbyshire. Then headed home, gave all of the cabinets a quick sanding, and repainted the whole thing in Behr with Floetrol added to the paint. It went on beautifully, and even 30 minutes after painting, I ran my fingernail over the surface to check the durability, and it was just fine. So I scratched a little harder, and it didn’t scratch off at all. The whole section of cabinets turned out really beautifully. 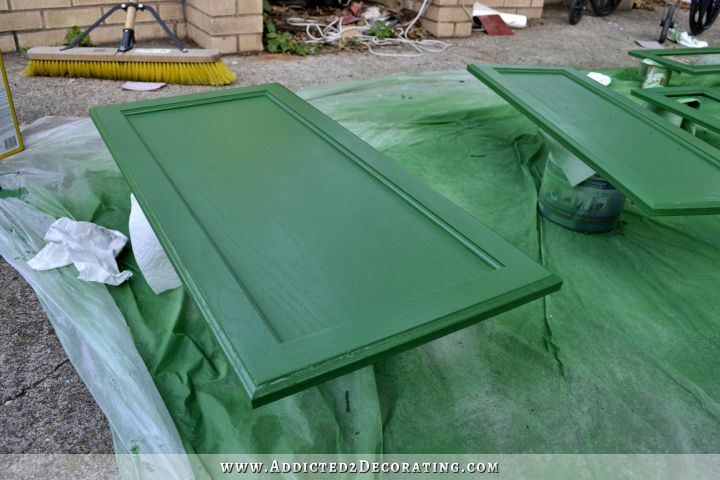 Then I sprayed the doors with the Behr paint with Floetrol paint conditioner added. For the most part, they sprayed beautifully. But next time, I’m going to get a strainer and strain the paint as I put it into the jar of my paint sprayer because every little dried bit and blob that got into the paint clogged my sprayer. That was incredibly frustrating. The finish was really gorgeous, and had I used any other sheen other than flat, I might have been tempted to just leave it alone. But flat paint is so finicky. You can’t really touch it or brush up against it (especially dark colors like this green), because any little thing will show on the paint. So then it was time to add the clear coat. The part that I clear coated with a brush inside turned out quite streaky. I was kind of afraid that that would happen. That would happen with any brand of water-based polyurethane. Water-based polyurethanes dry so fast that in the time it took me to get down from the ladder, move the ladder, and get back up to continue painting, the previous section has started to dry and became sticky when the brush hit it. And that leaves unsightly streaks. So brushing on the clear coat is not an option. It would definitely have to be sprayed. The good thing is that this stuff does dry super hard. That’s just what I wanted. However, what I didn’t want is that super shiny finish. Does that finish in the picture above look “satin” to you?! Ummmm…no. That’s at least a semi-gloss finish, if not glossy. And if I wanted semi-gloss or gloss, I would have purchased semi-gloss or gloss. It looks a bit more satin on the large areas of the doors, but still on the edges there’s quite a bit of shine to it. So that has been my very frustrating experience this weekend with painting. Part of me wishes I had just followed through and used the tried and true oil-based paint in a satin finish. That’s what I used in the condo kitchen, and I always loved how those cabinets turned out. And the paint was very durable. The problem with oil-based paint is that it yellows over time. So if you ever do have the need to go back and touch up a scratch or chip, there’s just no way the paint in the can will match the paint on the cabinets. But what a gorgeous finish! And what I hate about latex paints is that they remain sticky/tacky for so long, and they just don’t dry as hard and durable as oil-based paints. That’s why I thought I’d try out a clear coat this time, but I do not want shiny cabinets. So I kind of feel like I’m back at square one. I’ve worked for days on these cabinets, and I honestly don’t know what to do now. I could try out a different brand of clear coat. Rust-Oleum makes a matte finish water-based polyurethane that has the most gorgeous finish. But I don’t know if it would be good to use in a kitchen. I tried it on my butcherblock countertops in the condo, and every time water dripped on it, the poly would turn cloudy. Once it dried, it would clear back up, but it was a pain. Of course, using it on kitchen cabinets would be different from using it on an actual countertop that’s by the sink and faucet. Or I could just start over with a completely different paint, and just be satisfied with a latex enamel paint. That would certainly make touch-ups easier in the future, but I’m just so hesitant to use latex paint on kitchen cabinets. *Sigh* So frustrated. So confused. So ready to be finished with this kitchen. Try Wipe on poly. I used that for my unfinished dining chairs when I stained them years ago. I had done baseboards with the brush on poly before and it was such a pain I decided to try it since I wanted stained chairs. Still holding up beautifully and no streaks etc. Just takes more coats and very light careful sanding in between with steel wool. I’ve only ever seen oil-based wipe-on poly. Do they make it in water-based? I don’t want anything oil-based over the paint because it’ll yellow the paint color. Yes, water based is what I used. Didn’t want the yellowing and long drying time. Love the stuff, but have always had to order it (Amazon carries it too). I apply it in light coats with a very lightly dampened cheesecloth. LOVE LOVE LOVE the green! I had the exact same problem with my satin clear coat on my cabinets! I ended up discovering that it was because I hadn’t stirred it well enough. First time…it looked like semi gloss. After better stirring, aaahhhh, satin finish! I had the same thing happen to me, did not stir enough so the floors looked like gloss instead of satin….. So sorry you are frustrated. Your kitchen is going to be absolutely beautiful and valuable lessons will have been learned along the way. It WILL be worth it! I say go with your tried and true, tested and approved paint method. You will have to start over, but you will be happy with the end result and that is really what you want when all is said and done anyway. Keep on keeping on! I wonder what the Kelly-Moore people have to say about your glossy non-satin “satin.” We have to be able to trust claims made on labels. I guess that they would have to say that the term “satin” is subjective, in the eye of the beholder. Well, this beholder agrees that the section of cabinet you depict is semigloss at least! Don’t know how much work it would be to start over with oil-based paint. I don’t think you are going to ever be happy with the latex Kristi. I’m so sorry you’re frustrated! I painted our cabinets in BM Advance as well as our backsplash. I’ll grant you it’s only been 6 months at the most, but I have a husband and two teenagers who are not terribly careful and the paint is holding up really well. My dad even bled all over the cabinets doors when he was drilling for the hinges, didn’t see it until the next day and the doors wiped up perfectly clean, and they’re white! I’d use this paint again in a heartbeat. Have you ever had issues with mixing (by that I mean layering) oil and latex paint? Or acrylic? I can never remember if it’s ‘no oil over latex or no latex or oil’ but I thought without a primer in between you can get crackling. I think the harder oil can crack if painted over the rubbery latex, so maybe it won’t be an issue here. I’m curious about an acrylic clear coat over oil primer and latex paint. Anyway, I’m so sorry for your frustration. I hope you quickly figure out what works best for you. On a brighter note, the color is beautiful! It’s no oil over latex. I remember it clearly from my research when painting the exterior of a house I used to own. Now the paints are often acrylic rather than old style latex but I’m not sure if the rule is the same for the acrylic paints. I’ve varnished a painting before then hated the shine. My fix was spraying Golden Varnishes Archival Varnish over it. Flattens gloss immediately. I used Cabinet Transformation. Loved the product. Even putting on the poly was a no brainer . Great satin finish and they can tint it. I’m sorry you have has such a frustrating time. But in the end it will all be beautiful! Try Breakthrough paint by PPG. It can be tinted to any color, and comes in a satin or gloss finish. It hardens beautifully and no top coat is needed. I added floetrol to mine and my cabinets turned out beautiful. I used a small roller to apply the paint. I’ve had latex paint on my cabinets for about a year now with no problems. They wash up wonderfully! And I have a husband, 6 kids and 9 grand kids who access these cabinets without the courtesy of gentleness. Not to mention the 3 dogs brushing up against them daily.They will need a little touch up I think this fall but that’s fine with me. And I never put a sealant, clear coat or anything on them. 2 full coats and a 3rd kind of “air brushed” on in Valspar paint Satin finish. They look great! I know you like oil-based paint and it does leave an awesome finish, but I wanted to share this with you: My cabinets are painted (white) with oil-based MARINE paint and at first, they were absolutely gorgeous. But it’s been a few years now (maybe 10?) and the white has yellowed significantly. Also, there are places where the paint has chipped a little on the sharper edges. Now, my only option would be to completely refinish them, and I’m not physically able to do that.So for now, I’m just pretending that the yellowing and chipping are a deliberate “distressed” finish, lol. In my former house, I painted my cabinets with latex paint. They did have to be repainted a few years later, but it was so much easier! If this is your “forever” house, I think you’ll be pleased in the long run that you did use latex. Good luck on resolving the satin vs semi-gloss issue. I don’t like shiny either. @LBriscoe, I am curious to know if you painted your cabinets originally or were they done by a kitchen professional (for lack of a better word)? The reason I ask is that I have the same problem. My cabinets are much older 23 years, but were custom made at a kitchen design place. I assume they were sprayed, but I do have chipping right down to the bare wood in one spot, and since I have painted the interiors this past month, I can really see how the outsides have yellowed. My plan was to remove the doors and drawers, sand everything, then make sure they are dust free and apply the Zinsser Oil Primer. After that (I am following instructions from someone who has done it) I will paint them as much as possible with a small foam roller and brush where I have to. I was told to be prepared to use at least two coats and preferably three to obtain a smooth as glass like finish that is hard as a rock. The paint is a a self leveling paint so I am hoping all of this works or my husband will have my head (he wants to pay someone to do it). My attitude is I have seen pro painters work. I know I cannot do walls as well as they can, because I don’t want or like to. However, I like to paint furniture, so I can think of a lot of other things to spend two or three grand on….with that thought in mind, it’s damn the torpedos, full speed ahead! Actually, not until October when I know have a maximum amount of time that my husband will be away, LOL. MaryAnne, my oil-based painted cabinets were spray painted by a pro. The latex painted ones in my former house, I painted myself. I admire you for even considering repainting them yourself with oil-based paint. When I did the latex ones myself, I watered the paint down just a tiny bit to make a sort of self leveling paint. I wish you all the luck in the world on your kitchen project. I’m sorry that your paint/coating didn’t turn out like you wanted it to. That is never a good feeling. For my $.02 I think it looks beautiful but then again, I don’t have to live with it. Not sure what to tell you but I know when you’ve doubted your choices in the past most of the time you’ve gone back and followed your first instinct with positive results. Hang in there. Sure might be worth trying the Minwax wipe on poly before you decide to completely start over …. loving the color! Take a deep cleansing breath, go outside and walk around, and wait for some ‘divine inspiration’ … I have confidence in your problem-solving skills! Situations like this are what keep me reading your blog … you share the hits AND the misses and show us the real process of DIY. 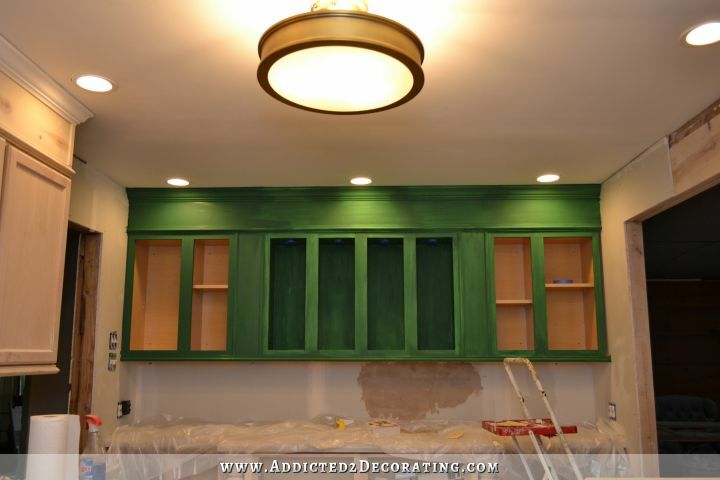 Frustrations aside, your green cabinets look glorious! Well, I like to use exterior paint indoors. Even on my walls. I get a deep finish and one coat coverage. I doesn’t seem as drippy. I love oil base paint because of the finish, hate the cleanup. Not sure what the fix is. But if you try the exterior behr paint in satin you should have durable without having to poly coat. 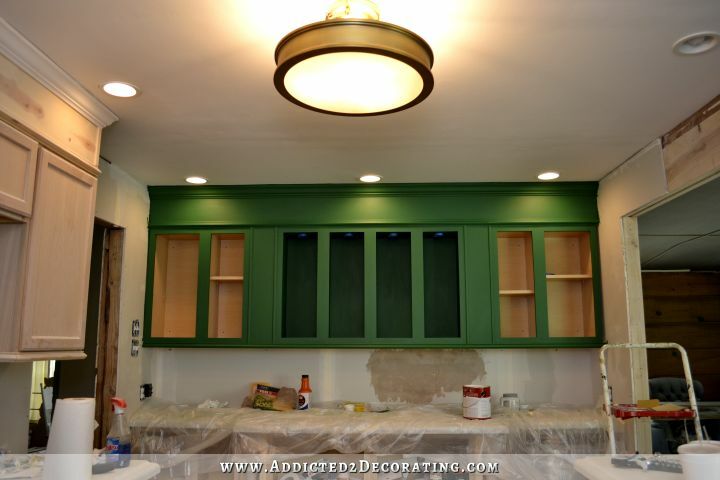 The green cabinets look awesome. I so admire your perseverance it is going to be a beautiful kitchen. Whoa, I didn’t know you could put water base over oil paint. If I were in your shoes right now, I’d redo the cabs in the satin oil paint and forget about the clear coat. Clear coat is a pia for me because I’m type A. I’d rather deal with touch ups or repainting. I haven’t used oil based paint yet since hubby despises it (clean up, etc). Our black and white cabs are a little over 2 years old, and holding up just fine to heavy use, grand babies, and cat rubbing. The only thing I would have done differently is to use semi-gloss on the black cabs, because the satin looks a bit dull, like chalk board. Also, semi gloss clean and dust better, satin can look a bit blotchy if not done properly. I would get the paint you originally wanted, to do the sink cabinets and the cabinets on the frig and stove side. Get the wipe on poly for the full wall you have already painted. Call it a day and have a glass of your preferred beverage with your honey . I wish there was a magic wand to make this all turn out okay, but there isn’t so take a step back, take a deep breath and call your mother. That always makes us feel better. I painted my kitchen cabinets with latex satin finish paint years ago and they still look great. I sanded my cabinets down to bare wood and painted them black. Which I still love and they still look great!!!!! Rats that you’re having problems with the clear coat and shine. The color looks gorgeous! I had a similar problem once and the only thing that made a difference was stirring and stirring and stirring before I used it. Did I mention stirring? I found out that whatever’s in the finish that determines the sheen really, really settles in the can. We own a cabinet shop. Not sure why you were so hesitant to use latex paint on your cabinets. We use a waterbased paint on all our cabinetry. The brand name is “Muralo.” It is very hard, durable, & 100% acrylic. I do all the finish work on our cabinets. After switching from lacquer paints, this is the way to go. We never get callbacks from dissatisfied customers in our 20 years of business. Good Luck with yours! Good to hear about Muralo. 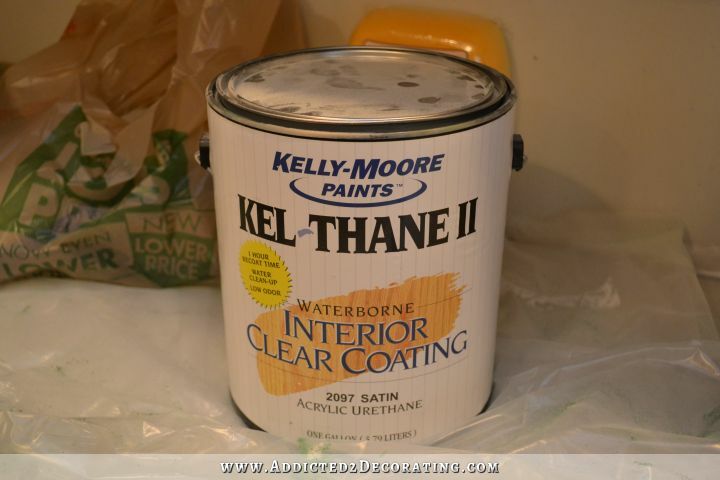 Web researching results were Muralo is tops for cabinets, when I called the paint store the owner said its what he used on his cabinets. After stripping down to bare wood which is redwood from California I think we will end up clear coating. Does Muralo have clear coat? The color is great. I certainly have empathy for your situation, but I haven’t seen a problem you couldn’t solve yet. 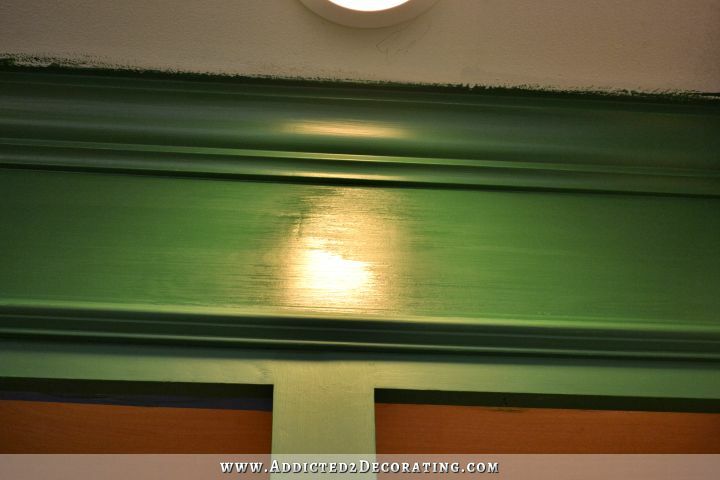 Surprised that you painted the crown molding green. 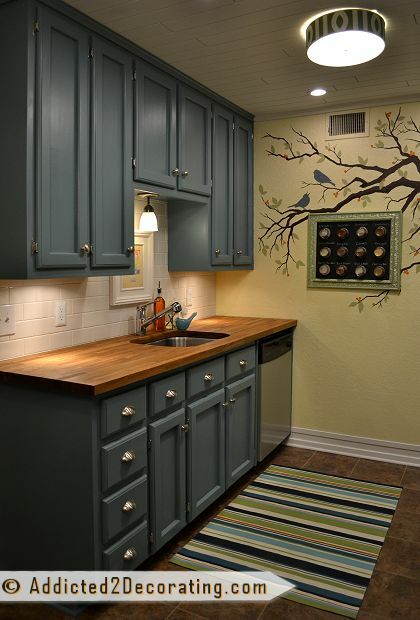 It looks wonderful over the cabinets, but does that mean you are not going to use crown molding above the tiled walls? I usually use two coats of poly over the latex paint. It seems to work so much better than the one coat that shows the overlapping. I’m sorry it was/is so frustrating. Been there many times and it sometimes takes the air out of the proverbial balloon. Wish I could help. We used wax as a finisher on our cabinets. Primer, two coats of latex (Behr), then wax. I rubbed it on, left it for a few minutes, then rubbed and buffed it off. Very pleased! I’ve painted kitchen cabinets twice in the past 2 years and we had excellent luck with both BM’s Advance paint and SW’s ProClassic line. Neither of those need a top coat. I was iffy on it originally but they both dried to a rock hard finish. And they only needed 2 coats. It might be worth looking into so you don’t have to bother with streaky top coats? Either way I loooove the color on the cabinets! It’s going tobe beautiful! Beautiful color Kristi. You are doing an amazing job on this kitchen! 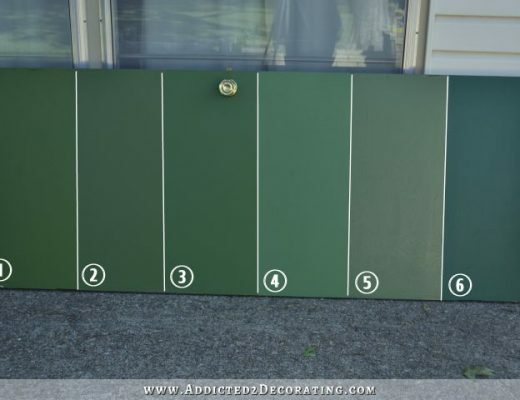 I would suggest trying out any other finish options on a scrap board first, much like you did for the colors. Cant wait to see how it all comes together. You have come a long way! We took part in renovating our church parsonage last year. Long story short, I spent alot of time researching different poly’s for finishing the oak cabinets that my husband built for the reno. I too, did not want shiny. I was a minwax fan for years and found that their ‘satin’ finish was no longer satin!! After talking to a guy at the hardware, I learned that there was a government crack down on these types of products. Everyone had to revamp the ingredients in their finishes to meet government standards. That is why satin is now glossy in appearance! The oak floor was refinished as well at this parsonage. Then they used minwax as the poly….yep! The gorgeous floor is now so high gloss shiny that it looks like an ice rink!! So sad after all that work! The brand that I found to be truly satin is a rub on by General Finishes and it is called Arm R Seal. Not sure if it would be for over paint as I am using it on stained oak and it leaves the softest most satiny finish you will ever see! You can get it from http://www.rockler.com Hope this may help! I hate when I have to undo and re-do things too. Ugh! I’d use enamel paint. I’ve used it before on cabinets and it looks beautiful. Your page inspired me to start our cabinets, which we were going to paint, but are liking the naked wood so might just clear coat with Muralo…pricey but don’t want to be doing this again for a long time. I feel for you cause I end up in the same frustrated place alot. I think creative people get bored with doing the same thing and decide to mix it up a little – then we get frustrated when it doesn’t work and takes way longer to fix than if we did it right (the way we know) the first time. 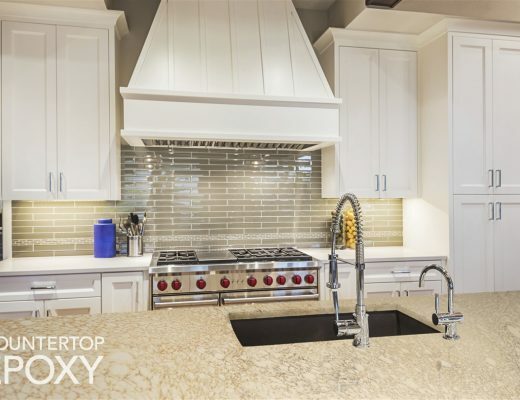 It probably comes down to what you can live with – does looking at those cabinets drive you crazy every time. Then sand and start over with your first instinct…oil. Because in the end, its what you like and what bothers you! best of luck and extra money! LOVE the green! I have been so excited to see the color up on the cabinets. It looks WONDERFUL!!!! I did not read all of the comments left by others, so forgive me if I repeat anything that has already been said. 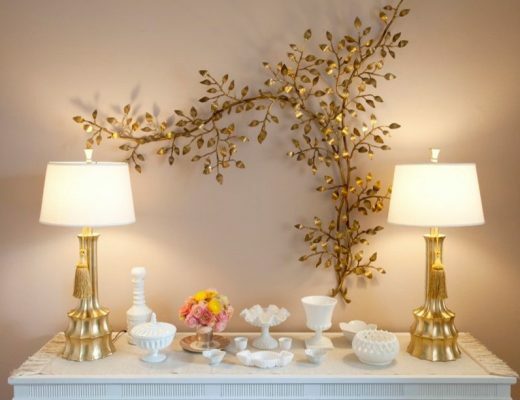 If you don’t mind some advice from an interior decorative painter of many years, here goes. You don’t need a clearcoat at all on cabinets. However, you may know that the higher the paint sheen, the more durable it is. Conversely, the flatter the sheen, the better the coverage. Also, 100% acrylic paint will give you a finer finish than latex. If you want to do water based your best bet would have been to use a 100% acrylic paint (Muralo is a superb brand, for eg., if you can find it), in a satin sheen. If you really want a clearcoat after that, my favorite has always been Diamond brand Varathane, carried by Lowe’s and others. If it were me, at this point, I’d prob just pick up a quart of a 100% acrylic in the color that you have there, do one thin finish coat and call it a day! Your color choice is so unique and I love the way it is turning out, in spite of the disappointing set-backs. All paint is not created equal. I’m a big fan of Benjamin Moore waterborne satin impervo, but it isn’t commonly stocked in stores and you might have to have a BM dealer special order it. I have also heard good things about Sherwin Williams ProClassic and Benjamin Moore Advance. I also don’t like that oil yellows over time. I have also heard of a product called cabinet coat that is specifically for kitchen cabinets. I’m not sure where you would go to get it tinted though. I’ve painted kitchen cabinets and more furniture than I care to remember, finally found that a flat acrylic paint topped with satin wipe-on poly works best for me. Gives a sheen like eggshell paint but with more depth. I have my feet on a thrift store coffee table right now that I painted about 8 yrs ago, it’s held up great with no chips to be seen. Wasn’t sure about your green color at first, but it’s growing on me!